Leading uniform provider joins Soles4Souls to collect gently-worn shoes to help disrupt the cycle of poverty around the globe. One person’s unwanted shoes can help provide meaningful opportunities that many in developing nations need, which is why Uniform Advantage has launched a shoe drive to collect pairs of new or gently-worn shoes. The shoes will be delivered to Soles4Souls–a non-profit social enterprise that creates sustainable jobs and provides relief through the distribution of shoes and clothing around the world. Founded in 2006, the organization has distributed more than 30 million pairs of new and gently-worn shoes in 127 countries. The income generated by selling just one pair of shoes in Haiti can provide up to five meals for a family in need, whereas 30 pairs sold by an entrepreneur in Honduras can provide up to a year of schooling for a child. Revenue generated by Soles4Souls’ micro-enterprise operations funds the organization’s free distribution programs, that provide new shoes to people in need both in the U.S. and around the world. 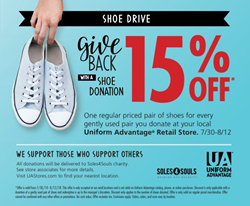 Between July 30th and August 12th, bring your new or gently-worn shoes of any kind to your local Uniform Advantage retail store.